As people age, falling becomes more dangerous, and they may be more susceptible to fractures as a result of bone thinning disorders such as osteoporosis. Seniors aren’t just susceptible to falling while walking. They may also be prone to falling out of bed at night. Fortunately, there are some ways you can keep your aging loved one from falling out of bed. Padded bed guards can be extremely effective in preventing falls from the bed. They’re made from soft materials and won’t cause injuries if your loved one brushes up against them. To use a padded bed guard, place the bed against a wall, then position the guard on the other side. While you can use two padded bed guards, your loved one may feel more secure with one side of the bed flush against a wall. Certain medications cause agitation, restless leg syndrome, confusion, and frequent urination, all of which can prompt seniors to get out of bed. If medications cause confusion, disorientation, blurred vision, or dizziness, seniors may fall out of bed. If you believe your loved one’s medications are causing adverse reactions, make an appointment with his or physician. The doctor can determine which drugs are causing the side effects and then may lower the dosage. If a dose reduction fails to resolve the side effects, the doctor may discontinue the medication and prescribe a different one that is less likely to contribute to side effects. It’s also important to note that while prescription drugs may be more likely to cause side effects, over-the-counter medications can also cause adverse reactions such as drowsiness, dizziness, and blurred vision, raising the risk for falling out of bed. If you’re concerned about ensuring your loved one’s wellbeing because he or she experiences side effects from essential medications, a professional caregiver can be a wonderful asset. Certain age-related conditions can make it more challenging for seniors to age in place safely and comfortably, but Fair Oaks live-in care experts are available around the clock to help seniors manage their health. Whether your loved one is living with dementia or is recovering from a stroke, you can trust the professional live-in caregivers from Home Care Assistance to enhance his or her quality of life. If your loved one becomes disoriented during the night and forgets he or she is in bed, a fall may occur. For this reason, you should keep a nightlight on at all times in your loved one’s room. This way, your loved one will know where he or she is and avoid falling out of bed. Keeping a nightlight on can also prevent falls on the way to the bathroom. Nighttime disorientation is a common occurrence for many aging adults. Seniors can face a variety of challenges as they age, many of which can be mitigated with the help of professional in-home caregivers who provide high-quality elder care. Fair Oaks families trust Home Care Assistance to help their elderly loved ones age in place safely and comfortably. If your parent is demonstrating behaviors you haven’t seen before, he or she may be experiencing cognitive decline. An increase in anxiety, sadness, agitation, confusion, or combativeness may indicate memory loss or the beginning of dementia. These signs may also raise the risk for falling out of bed or wandering behavior. At the first sign of cognitive decline, make an appointment with a physician for a complete medical and psychological evaluation. In the meantime, consider sleeping in the same room as your loved one to make sure he or she stays safe when attempting to get out of bed. If your loved one has cognitive or physical challenges that increase the likelihood of falling out of bed, hiring a professional caregiver can give you peace of mind about your loved one’s safety. When researching agencies that provide home care services, Fair Oaks, CA, families are usually looking for flexible care plans, compassionate and highly trained caregivers, and 24/7 availability. 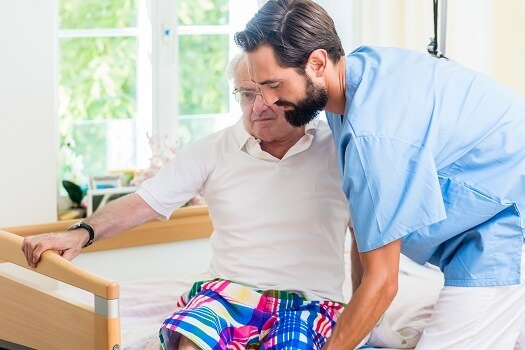 Whether you need respite care to take a break from your caregiving duties or your senior loved one needs around-the-clock assistance at home, you can rely on Home Care Assistance. Reach out to us at Home Care Assistance if you need compassionate, professional care for your loved one. Call one of our dedicated Care Managers today at (916) 485-4663 to learn about the high quality of our in-home care services.